This app is kind of a flash card with reading. 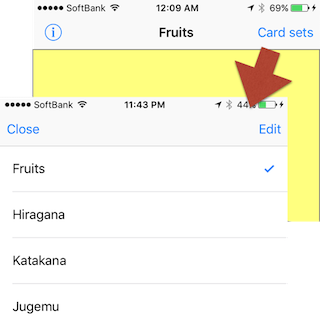 You can learn the basic Japanese character (shape and reading) from sample card sets in this app. You can make your own cards easily. Copy words or sentence, etc... from your textbook. This app is designed not only for Japanese. It has a variety of uses by your idea. Let's play a Karuta (Japanese card game) my child said. But I was busy in a moment. I wish someone would read it instead of me. That was the idea of Japanese Hajime no ippo. 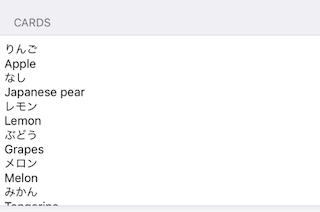 Why don't you let this app read a fairy tale? A child may read it by himself. There are two editions. Paied edition and free edition. These are the difference of each edition. Touch the screen or touch the play icon on the bottom. 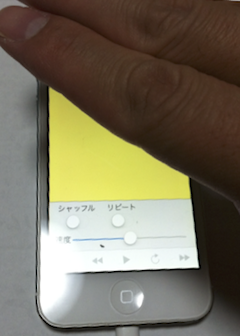 If the proximity option is turned on, it will read a card when you put your hand over a proximity sensor. Control part is located on the bottom. You can switch a page by flicking. If it's on, shuffle the cards. If it's on, back to the first card when it reaches the end of the card. It will be displayed when you turn on the pair card option. If you set first line Japanese and next line English. It reads reverse order, English first and next Jananese. Back to the first card. Start to read a card. Move to the next card. When you turn on the auto play, it plays cards automatically. If you want to stop it, touch the screen or play button. Set the interval time to read next card. Minimum is 0 sec and maximum is 10 sec. 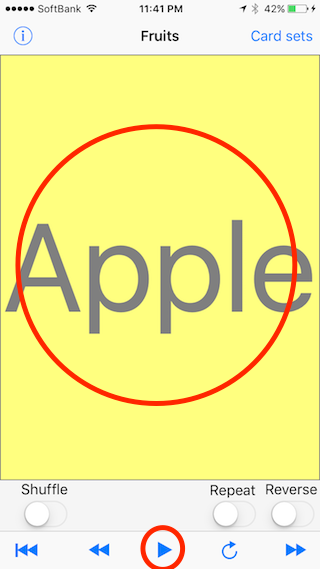 If it's on, reading a card when you shake the iOS device. It will be displayed, if it has a proximity sensor. Read out the card when you put your hand over the proximity sensor. 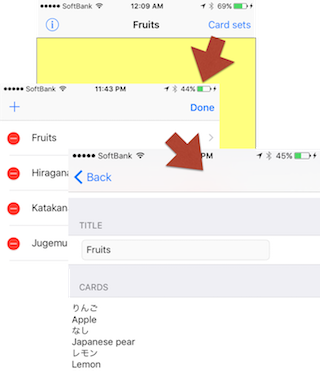 It will be displayed card sets, when you touch the Editing button on the top right. Back to the screen after you select card. The card set is listed, when you touch the Card set button. You can edit it when you touch the Editing button. If you want to create a new card set, touch the + button on top left. If you want to edit a card set, select the line. Set the title of your new Card set. Enter the Characters or Word or sentence which you want to read out. Each line acts as a one card. You can easily edit it by PC too. Some Japanese word will be made wrong reading. You can add a correct Japanese reading after a comma (,). If it's included a comma in a sentence, replace it to double comma (,,). Select a language you want to read it. If you turn on 'Q&A (Pair 2 lines)', odd lines act as a questions and even lines act as answers. At 'First line', you can select a language for questions. 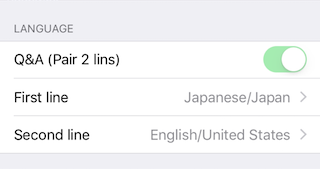 At 'Second line', you can select a language for answers. 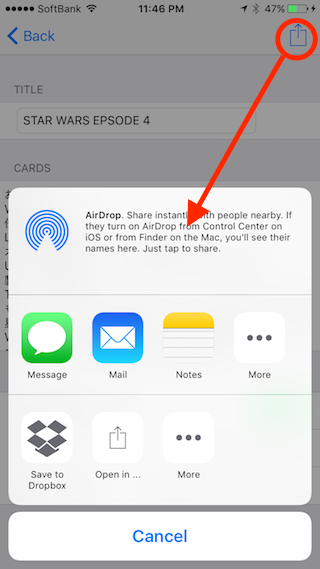 You can export a Card set to AirDrop or Mail, Note, etc... when you touch the action button on the top right in the editing view. The extension of an exported file is 'kikuma'. It's just a JSON data. You can easily edit it as a text file. 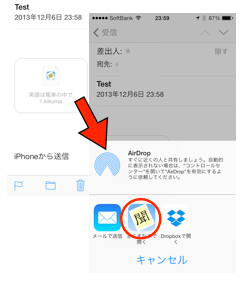 Touch an attached Card Set file in your Mail or Note or etc... it asks which app do you want to open? Select 'Hajime Jpn' then imported it.